Hermano Dr. Cesar Cabrera Receives NFL Hispanic Heritage Leadership Award | La Unidad Latina, Lambda Upsilon Lambda Fraternity, Inc. The Buffalo Bills have selected Dr. César Cabrera as the recipient of the NFL Hispanic Heritage Leadership Award. The NFL and the Hispanic Heritage Foundation (HHF) have partnered for the fifth annual NFL Hispanic Heritage Leadership Awards during the 2015 celebration of Hispanic Heritage Month. The awards recognize the contributions of Hispanic leaders in each NFL market. The Bills honored Dr. Cabrera on Sunday, September 20 at their Hispanic Heritage game as they faced the New England Patriots. Dr. Cabrera was born in the Dominican Republic and moved with his mother and two sisters to the United States when he was eight years old. Dr. Cabrera has held many roles in the political realm including his most recent appointment by Governor Andrew Cuomo as the New York State Department of Labor’s Commissioner’s Regional Representative. 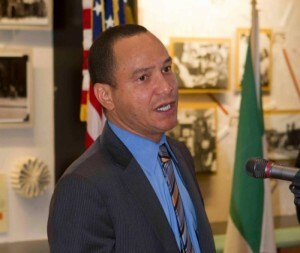 He has served as a director on numerous boards including Los Tainos Senior Citizens Center and the Hispanics United of Buffalo, and is one of the founders of La Prensa Hispana, a Hispanic monthly newspaper. The Buffalo News voted him one of Ten Emerging Twenty-Something Western New Yorkers in 1995 and he was named to the “40 Under Forty” honor roll by Buffalo Business First in 2002. Each award recipient will select an organization of their choice that serves the local Hispanic community to receive a $2,000 donation. Dr. Cabrera has chosen the United Way of Buffalo & Erie County to receive this donation. The NFL celebrated Hispanic Heritage Month during week 3 of the season. A national spotlight was shone on the NFL’s celebration during Thursday Night Football, Sunday Night Football, and Monday Night Football. The Hispanic Heritage Foundation is an award-winning nonprofit which inspires, identifies, prepares and connects Latino leaders in the classroom, community and workforce to meet America’s priorities. HHF also promotes cultural pride, accomplishment and the great promise of the community through public awareness campaigns seen by millions. For more information on the year-round, high-impact programs and work of HHF, including the Hispanic Heritage Awards, visit www.hispanicheritage.org. This article originally appeared on http://panoramahispanonews.com/. This entry was posted in News on September 22, 2015 by lul-admin.